Having worked in the industry for a long time, Lars Lundqvist got an idea regarding the way electrical cabinets should be manufactured. 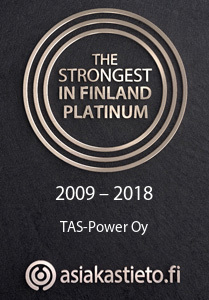 In 1992 the concept became a company as Lars founded TAS-Power Ltd in Kauklahti, Espoo. The company’s transformation from a small cabinet manufacturer to a noteworthy automation service provider did not happen by chance. It is the result of years and years of hard work and an eventful journey. Our satisfied long-term customers and flexible personnel have enabled the company to grow even through hard times. Nowadays TAS-Power employs about 20 electrical engineering and automation professionals. The products of TAS-Power can be found around the globe – on land, at sea and even in the air.